The lower bottom sash rail is particularly vulnerable to weathering. It’s one of the most exposed points on a sash window and the most common failure points on properties in North London. The bottom rail is only matched by the window sill in terms of how much maintenance is required to keep things in good order. In this example we need to entirely replace the bottom rail because maintenance wasn’t kept up. We will take a look at the repair process and how to prevent further repairs being required in the future. Sash window repair North London: how we replaced the bottom rail. Given this sash rail was practically hanging off there wasn’t a decision as to wether better to splice or entirely replace. Sometimes a minor repair makes more sense to carry out in situ, especially if the homeowner does not wish to service the windows, merely repair as is required to bring things up to a good structural standard. However, in this North London case where we are overhauling draught proofing the windows there was no value in trying to salvage this sash rail or effecting a repair without removal of the sash. So the first part of the procedure is to remove and treat the sash rail carefully and prepare it to be spliced. We try our best to avoid breaking glass but that depends entirely on how well the rail is bonded to the putty. If the putty is old and brittle there are generally no breakages whereas if the putty is fresh and still binding to timber and glass it can cause a problem. Like I say though, it’s rare because the whole reason a sash rail is rotten comes down to moisture in the timber and this almost always accelerated the process of loosening the putty from glass, if it hasn’t already fallen out. 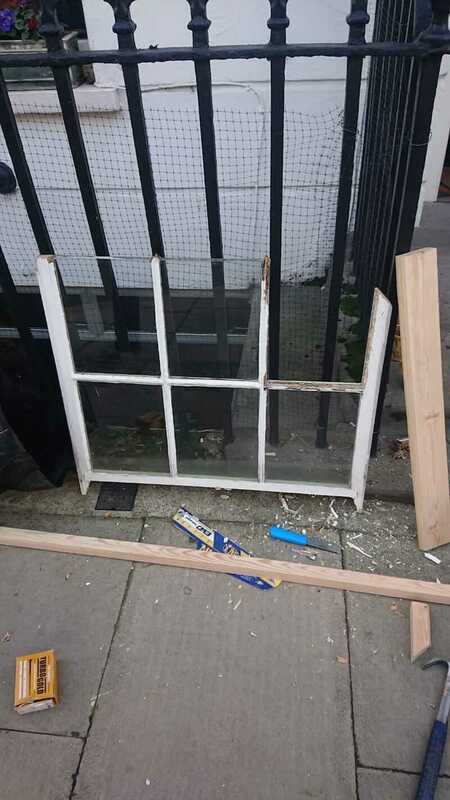 In this Sash window repair North London example we were unfortunate to lose a pane of glass, this is covered in the cost of the sash repair and no extra is charged. Sash window repair in North London before with sash rail removed. Here’s a look at the rail we completely removed in North London and made ready for a splice, it wasn’t really surprising the sill itself was in poor condition, normally when a sash rail is this bad the rot runs into the sill and requires sash window sill replacement too but that’s already covered in the link provided. The rail then needs to be attached with a series of screws and then resin bonded. We cannot rely solely on screws as this will allow moisture to continue to penetrate the timber if ever exposed again and it will fail. The joint must be resin bonded to ensure correct adhesion and stop moisture from cracking open the repair. Then we prime the repair and leave things ready for a decorator to take over, that is, once the window has been rebuilt with a draught proofing system. These windows were not double glazed, it was a simple case of overhauling and draught proofing to being the original windows back up to good structural condition. We did double glaze sash windows in North London if you would like to see that example too. As you can see the rail doesn’t look like it’s ever been worked on. That is what we aim to achieve from our sash window repairs, once painted you cannot tell that there was ever a sash window repair required. This is particularly pleasing on traditional sashes like these ones that are slender and elegant, and most commonly found in North London. Georgian sashes with six over six glazing bar look very pretty indeed. If you look at the picture, I know it’s not easy to see so sorry about that, but the sill literally had weeds growing from it. With timber of this quality rot isn’t a five minute process, this decay happened over a period of ten to fifteen years and the window was not decorated for longer than that, maybe thirty years! You can tell from the difference in colour between our white primer and the original paint. Why did the lower sash rail rot and require sash window repair in the first place? 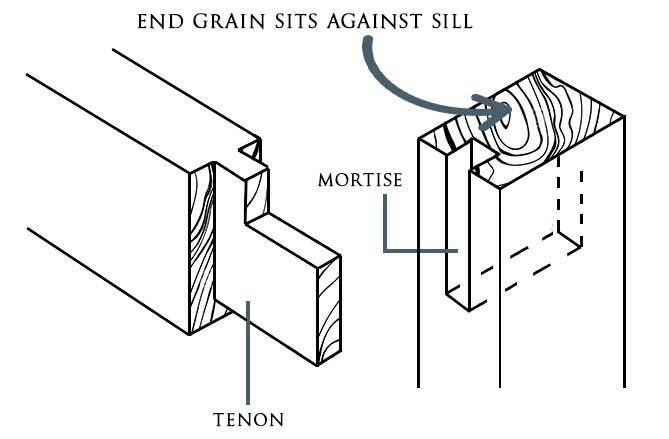 The main reason the lower rail fails is because the stiles are the only section of timber with the grain exposed touching the sill. I understand this is a little complicated to follow so in the diagram below you can see the timber running vertically on the sash. This is the stile and this is the most vulnerable because the end grain touches the sill section. Stile sits against sill leaving it exposed to weathering. Once paint deteriorates there’s nothing stopping the Xylem tubes absorb moisture in exactly the same way as a tree feeds. A tree doesn’t stop doing absorbing moisture when it’s dead.In fact that’s the whole reason a dead tree rots. Moisture is unabsorbed up the Xylem tube and within this water is fungi and bacteria which begins to eat the timber. When a tree is still alive it has naturally occurring chemicals which kill off these fungi and bacteria. Once dead, there is no protection naturally. We treat timber to prevent rotting. This also explains why modern timber rots more quickly too. If modern softwood timber is not treated correctly and left exposed, then it’s free to absorb water at a rapid rate because the fast growing tree does not have much grain density. This allows the tree to almost act as a sponge. 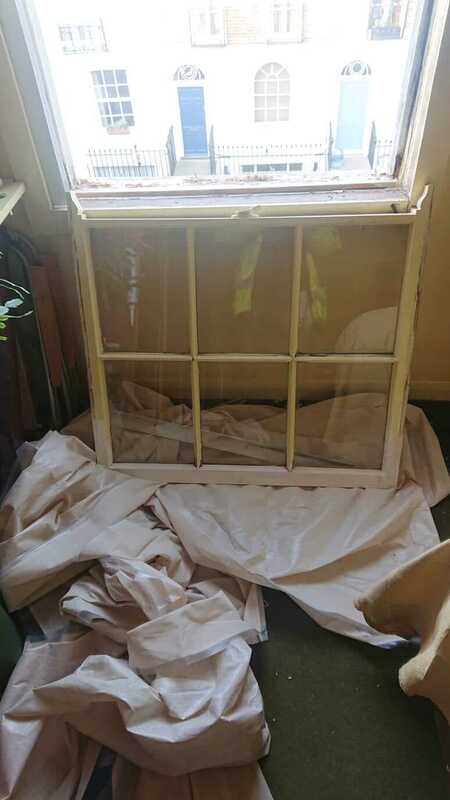 Not ideal, and certainly we ensure that all new sash windows we make are treated correctly as well as finished with a factory spray that bonds to the timber much more firmly than a hand finish. Below is a diagram that explains growth rings on trees and how they relate to the density of timber. As you can see modern softwood has just a few rings and some older BC Pine has as many as twenty. This tight grain means that moisture will not absorb so quickly and of course last far longer if exposed to moisture. The key to avoiding costly sash window repair in North London is painting every three to five years. This will ensure the timber remains in tip top condition.